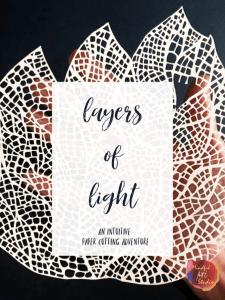 I’ve been trying to find the words to describe why working abstract, with no plan, and letting go of the outcome is such a mindful, exciting, and yet calming experience all at once. 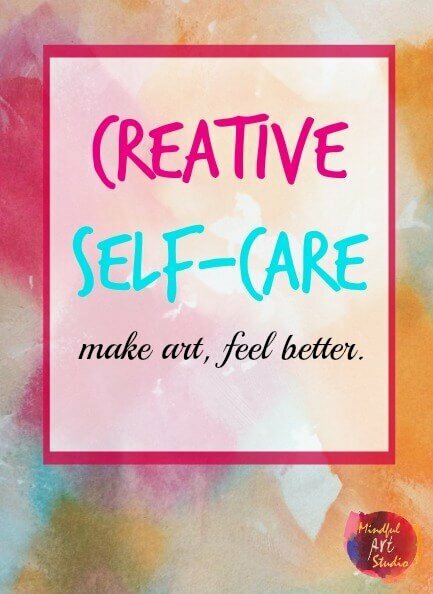 It’s one of my main forms of creative self-care these days, and really helps when I feel anxiety. I’m so excited to share how I use art journaling for anxiety. Please be sure to share it with your friends and anyone who could use a little help “ARTing it out” right now. 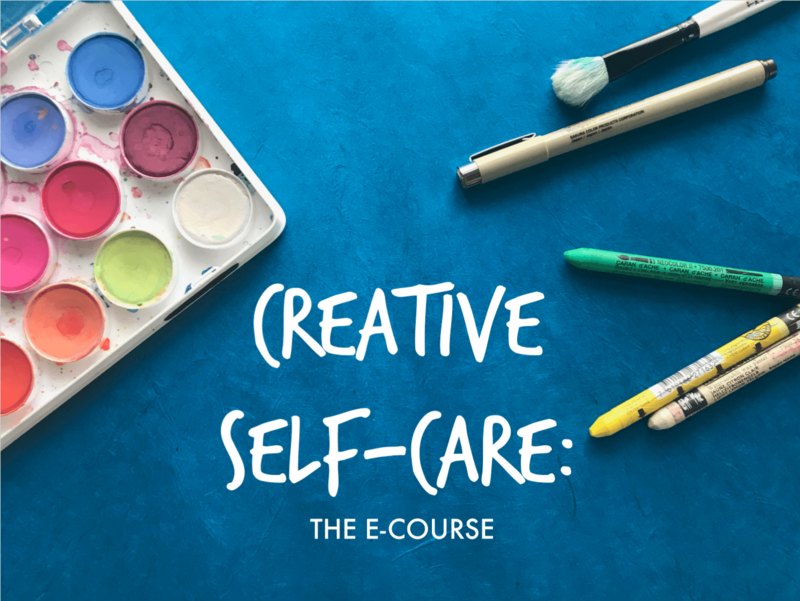 Start your creative self-care practice by getting your Free Guide to Creative Self-Care. 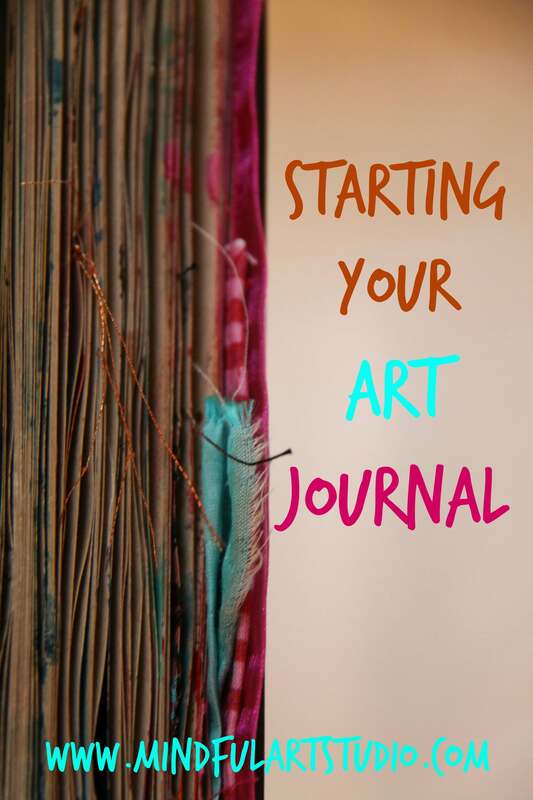 Learn more about art journaling. 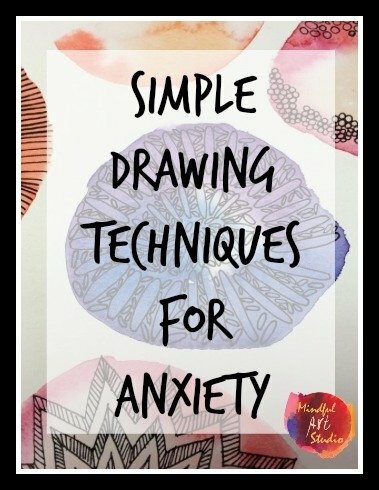 Practice mindful drawing for anxiety. 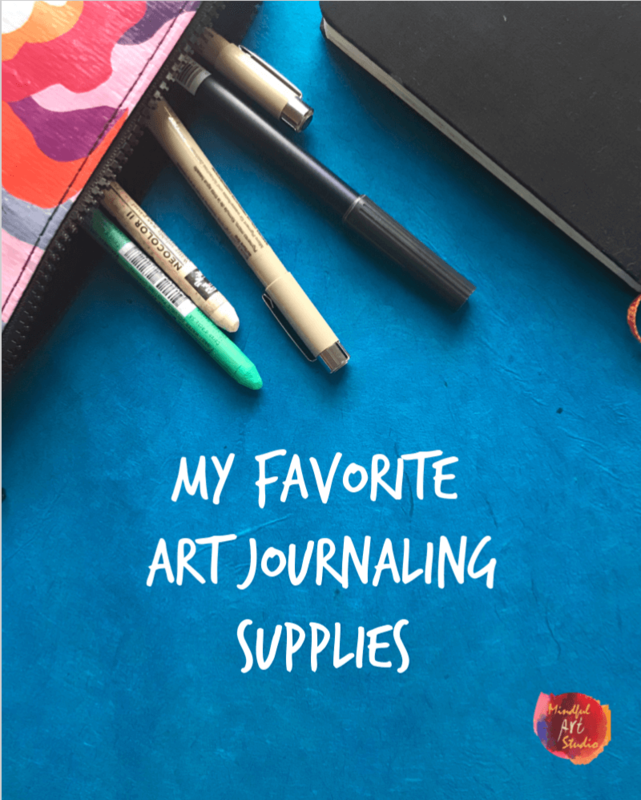 Make an easy and fun journal background. 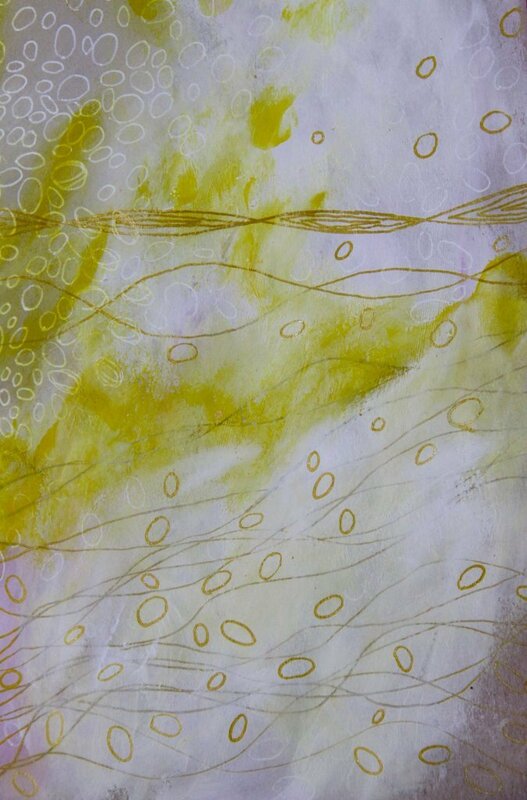 Or, make a background using tissue paper and water. 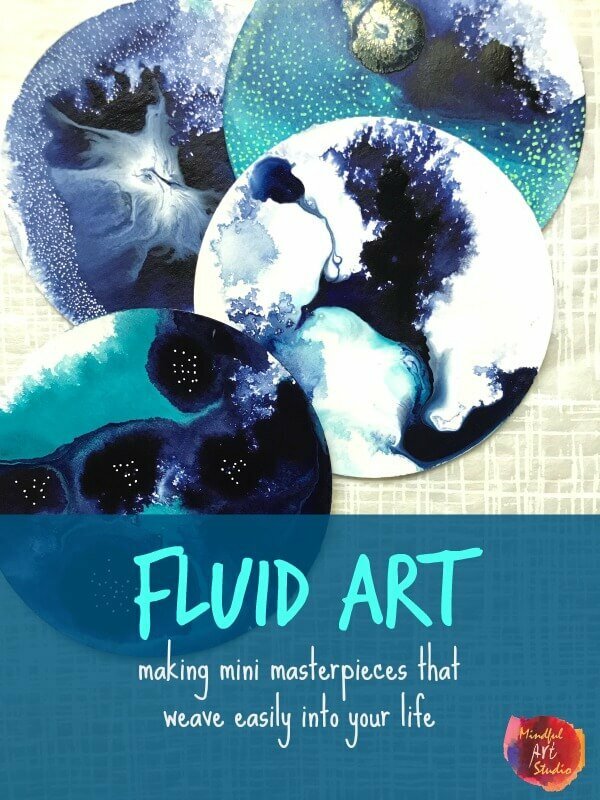 Dive into the flow of art journaling with this amazingly fun class: Fluid Art. Journal to clear your mind and banish perfectionism with my class: Freeing the Muse. 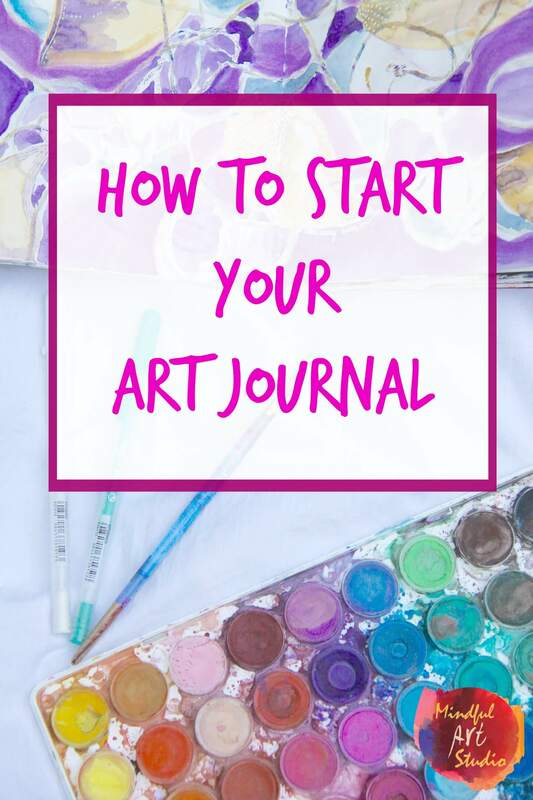 Learn to use art journaling as a form of creative self-care: Starting Your Art Journal. Get your hands on those high flow liquid acrylics here*. Read more about the work I do at Mindful Art Studio here. 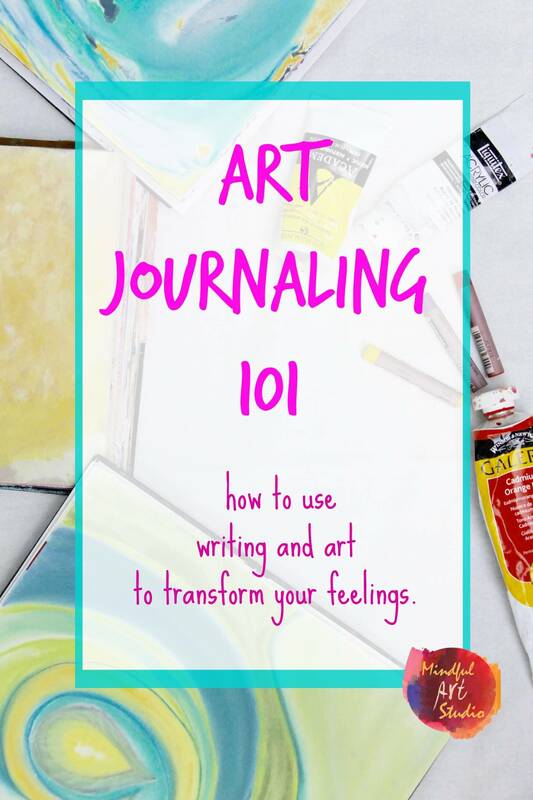 DISCLOSURE: The information described here is not art therapy. This post is for informational purposes and should not be considered a substitute for medical or psychological evaluation or treatment. Please seek advice from a mental health professional in your area if you are experiencing mental health challenges. 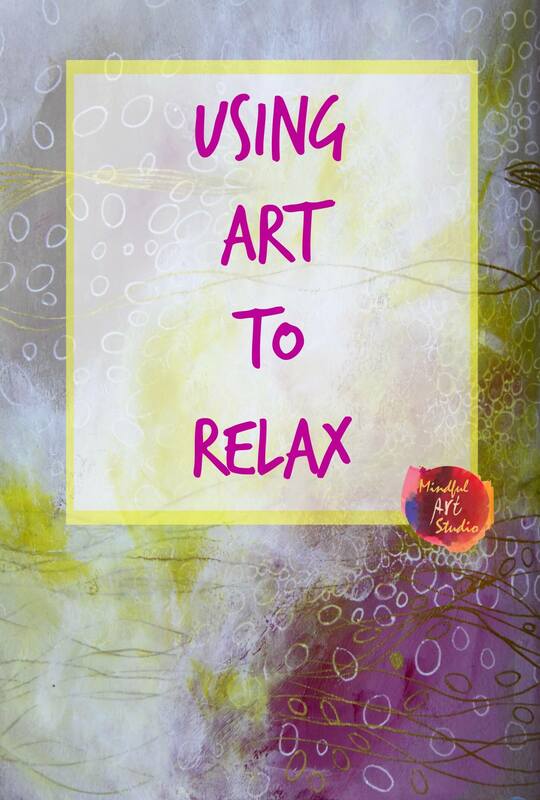 You can find an art therapist in your area by searching here. *The link provided is an affiliate link. 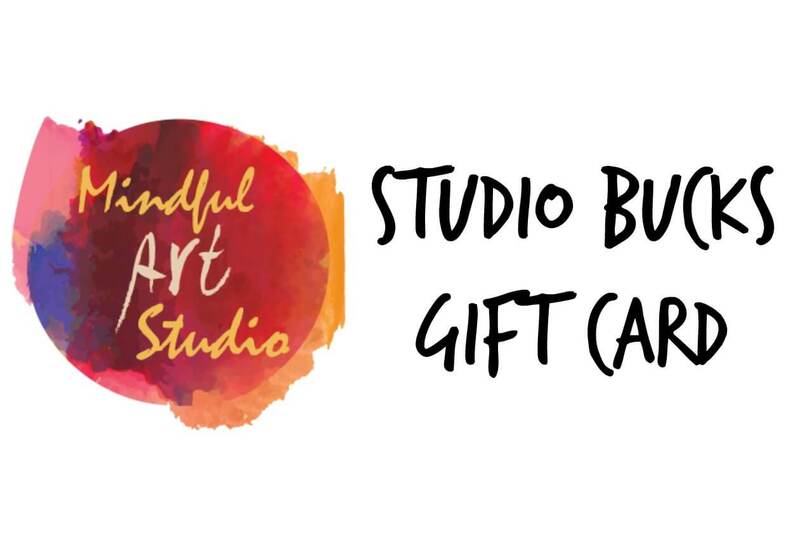 If you choose to click and purchase something, at no extra cost to you, you will contribute to the work of Mindful Art Studio. Thank you! 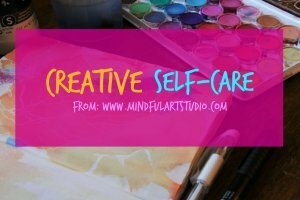 If you’ve hung out here at Mindful Art Studio you know that creative self-care is what I’m about – how to use simple art techniques to express your feelings in a playful, joyful way. As someone who tends toward the more anxious, driven, perfectionistic side of the spectrum, I know how effective art is for stress relief. 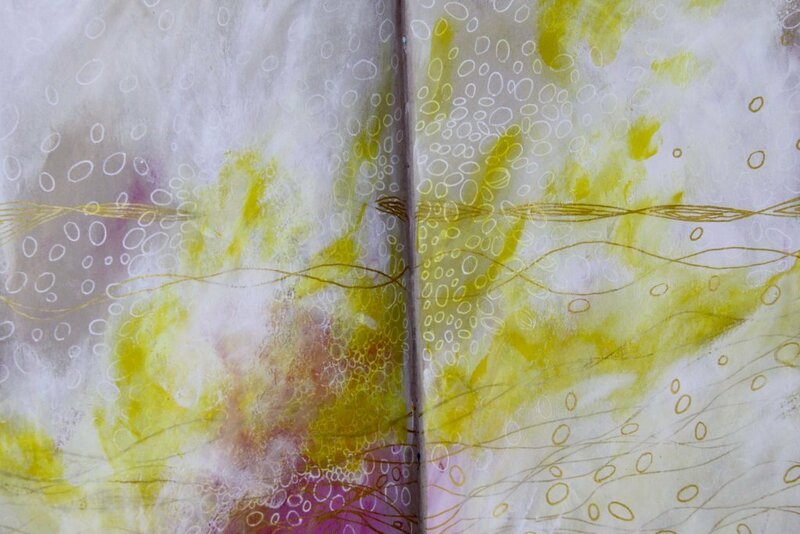 Art making invites me to get out of my own head, let go of control, and watch emerge on the the lines, shapes, and colors emerge on the page. 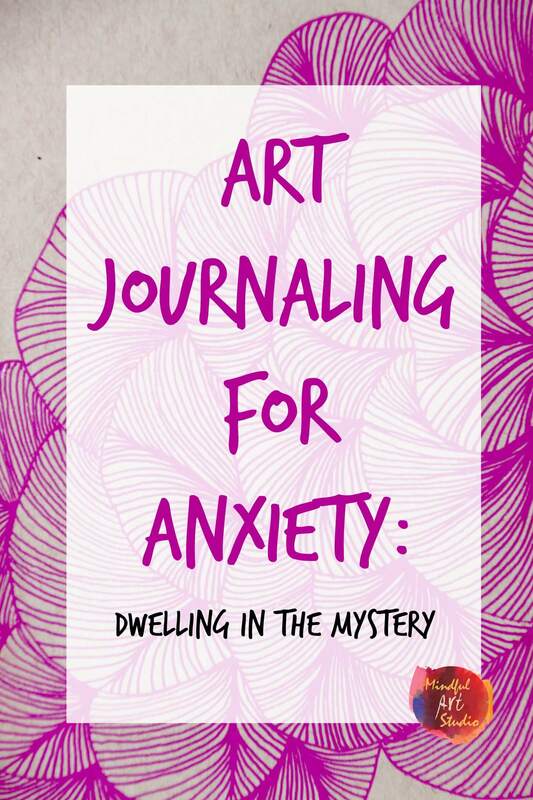 I’d love to give you an example of the way my anxiety can get in the way, and how art helps me practice letting go instead of worrying and controlling. Standing around with my training buddies before the run, I began quizzing them about whether they follow the 20% pace rule or 10% pace rule, and how they approach pacing these runs through the season, etc. I thanked my friends for delivering this message in a way I could hear it. Having a plan is great, but I also need to give myself permission to depart from it. At the end of the day, the reason I’m running is to enjoy it. At some point, it’s time to forget about the details and focus on the scenery, my breathing, the effort of my legs and arms moving, and the blessing of friendships forged over long miles. 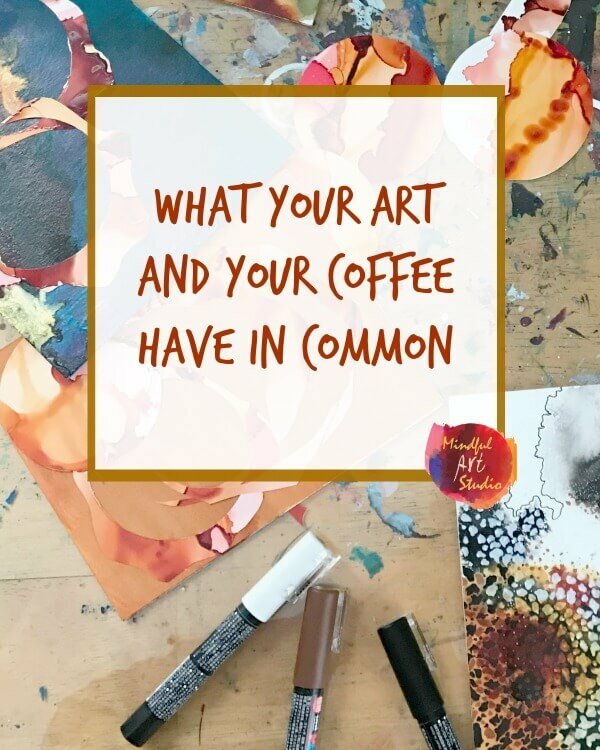 Art reminds me, like my running buddies do, that it’s important to not get too caught up in the details of any particular plan. Part of the joy is being open to what I find that particular day. If I dislike something I do, I can always cover it up with paint, cut it out, or glue two pages together and hide it. 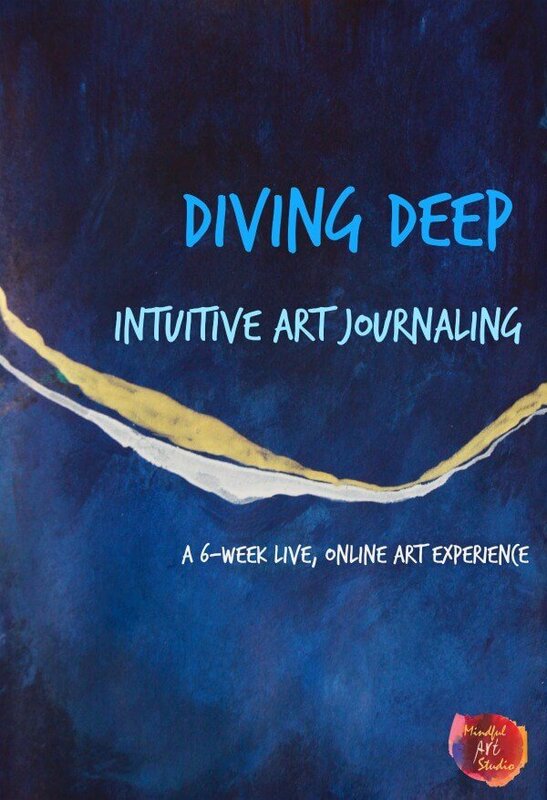 Art making this way is a metaphor for learning to let go and engage a mindful presence. 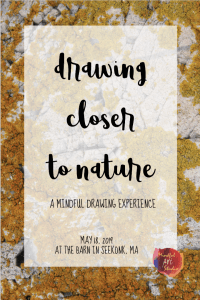 When I make art mindfully and openly, it’s a bit like running: I listen to my breathing, and notice sights, sounds, and sensations I’m experiencing. I let my imagination out to play. 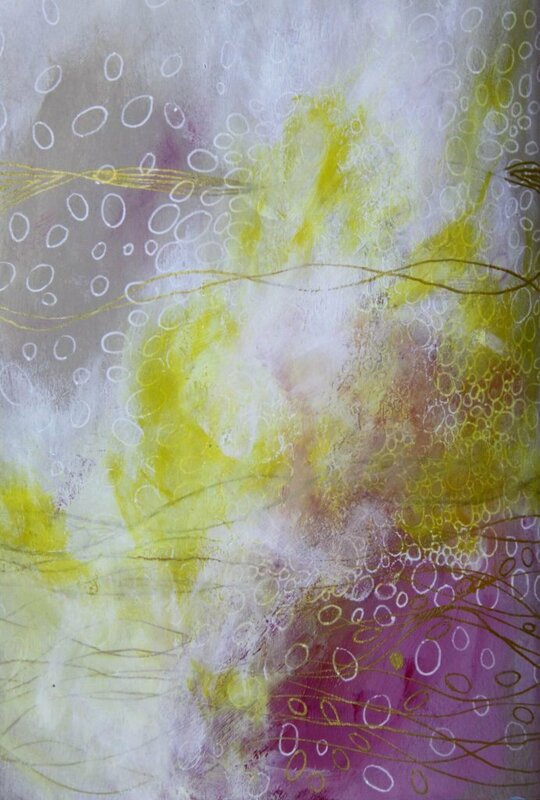 Like on the page below, as the yellow streaks appeared, I imagined fireflies or souls drifting off into the ether. With all the talk about how art heals, I think what a lot of people with limited art experience don’t understand is that you don’t need special skills or much “talent” to benefit from art making and art play. The power of art is that it lets you get lost in the creative realm, lose track of time, and let go. 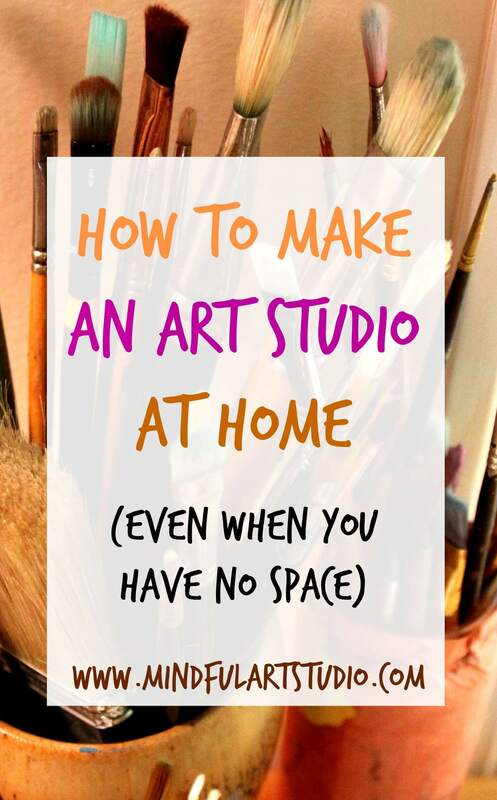 Anyone, even “non-artists” can sit down, explore mixing paint on a page, and potentially get stress relief. I find that when I open myself some of my best work emerges. Art has so many metaphors for your life if you are just willing to listen. 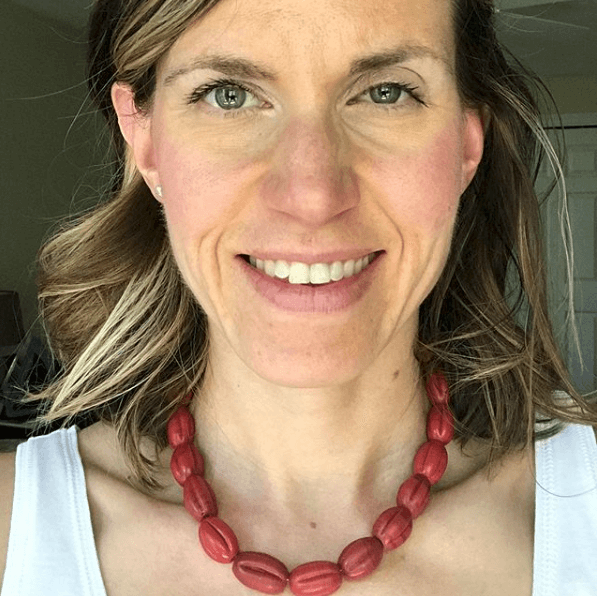 Mine speaks to me about mystery, letting go, and finding beauty. What are the metaphors that appear in your art? 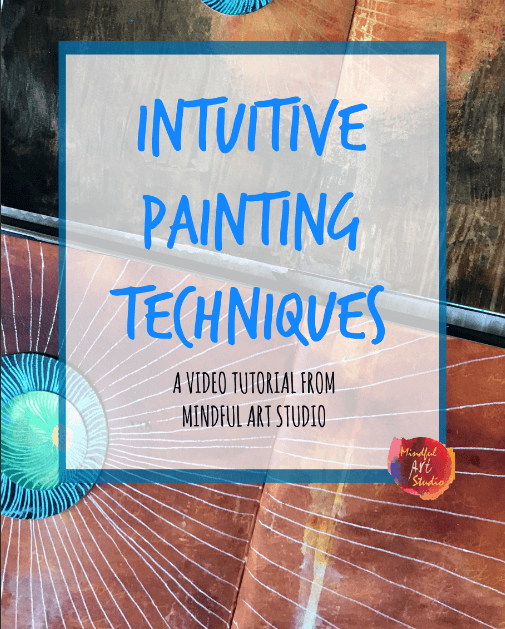 This is what I want to teach you: how to use art as a tool – a way to let go of life’s stressors and immerse yourself in painty, playful fun. 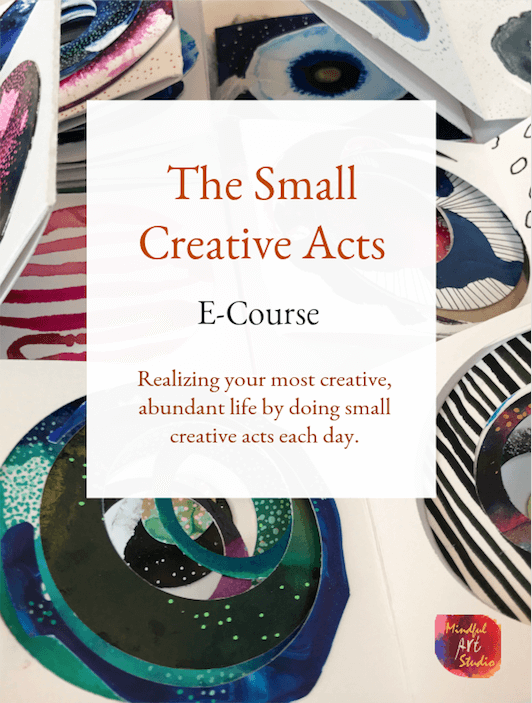 You can let go by exploring the colors, shapes, and wild creatures that appear in your art. 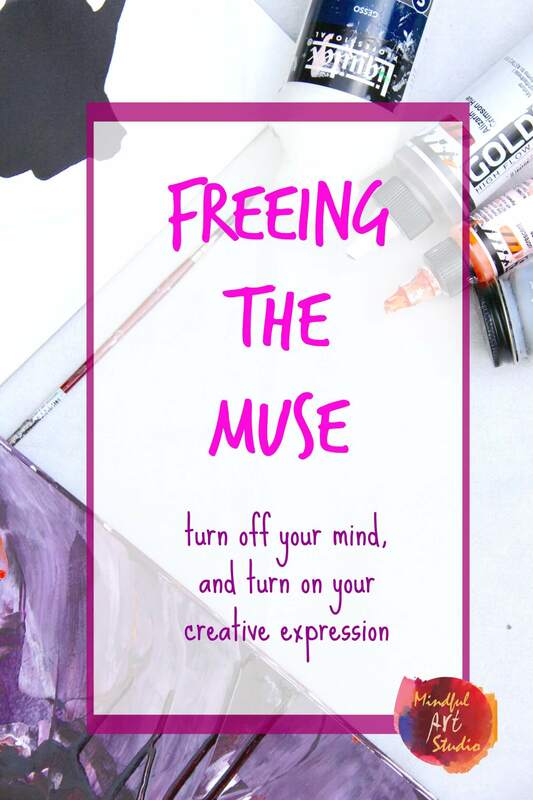 My new mini e-course, Freeing the Muse, is for busy, creative people who want to develop a way to relieve stress through art and for experienced artists who want to lose their creative inhibitions. 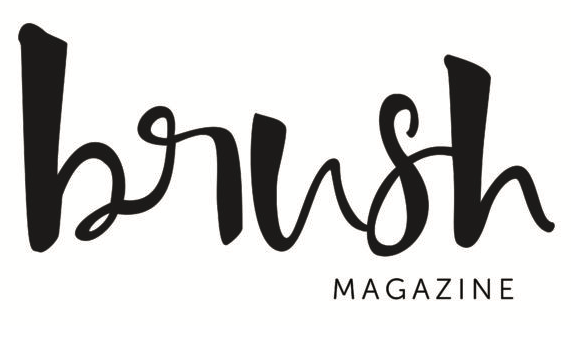 Tune into the pleasure of playing with art mindfully. 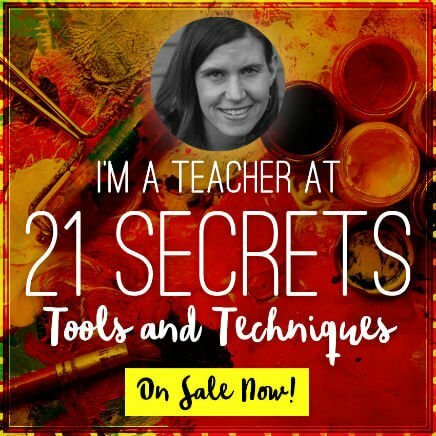 Learn how embracing “mistakes” in your art can lead to more expressive, creative work. 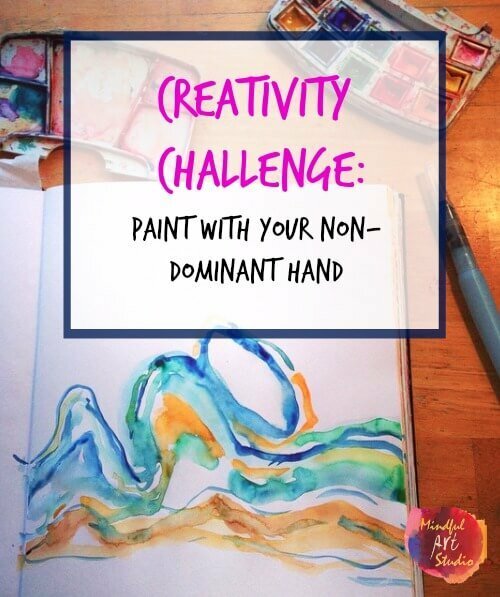 Create a playful, “judgment-free zone” where you can make art freely – no one has to see but you! 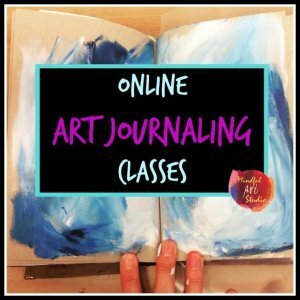 Make art without traditional art materials or techniques. Play with the metaphors that arise in your art. 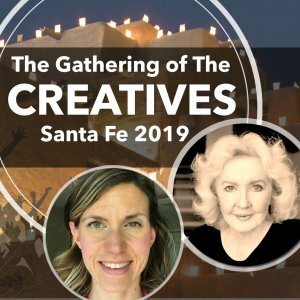 Develop forms, patterns, and mysterious beings that you never saw before in your art. 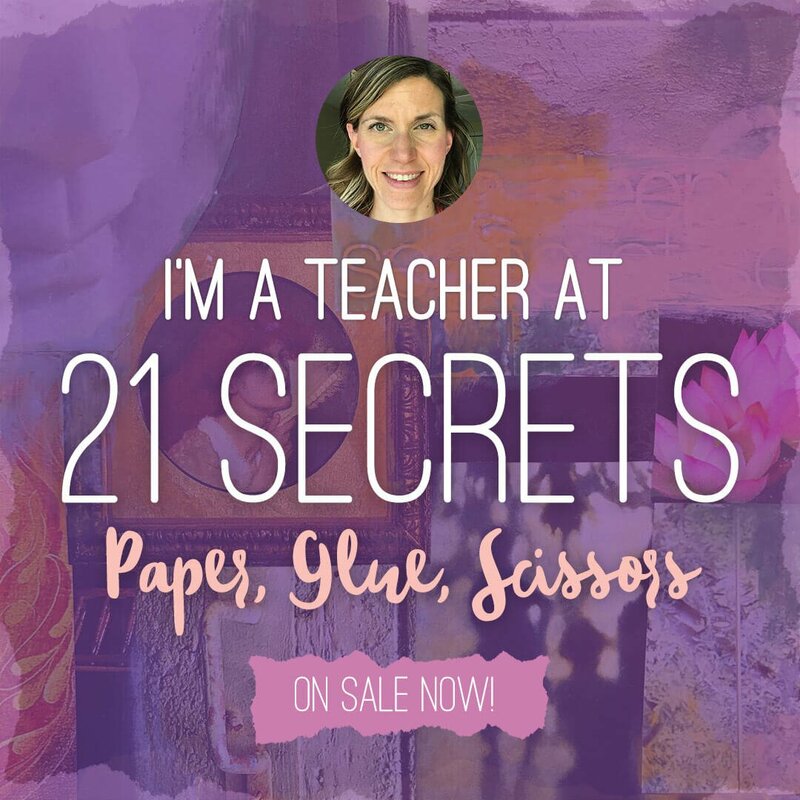 Join the community on a private FB class page to share your work and questions in a supportive community. Let me teach you how. You can learn more here. I’m so grateful that you’re here and shared this time with me today. I’d love to hear from you in the comments. P.S. 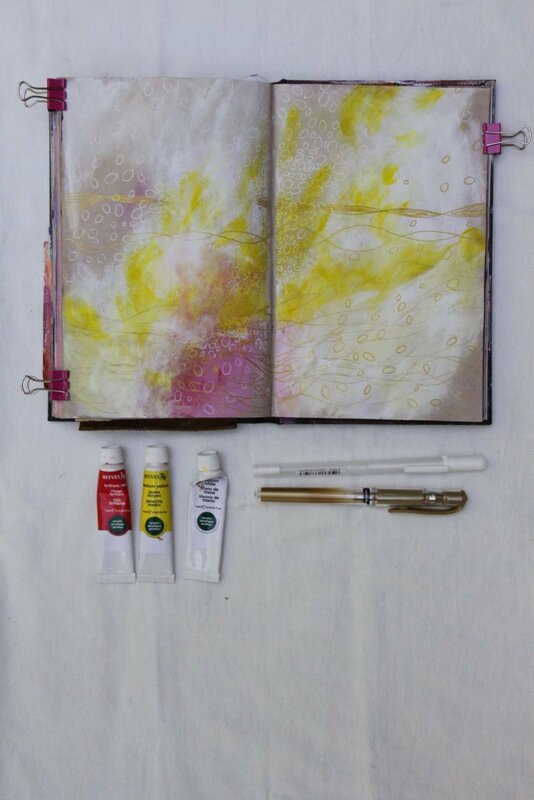 If you are interested in the materials I used to create this piece, I used my tiny tubes of Reeves paint from my portable art kit, my Sakura Gelly Roll pen in white, Sanford Uniball Gel pen in gold, and worked in my tan paged Strathmore journal. 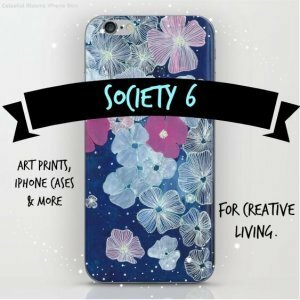 These are affiliate links, so if you choose to click and purchase something, you’ll support the work I’m doing here at no extra cost to you. Happy Art Making! DISCLOSURE: The information described here is not art therapy. This post is for informational purposes and should not be considered a substitute for medical or psychological evaluation or treatment. Please seek advice from a mental health professional in your area if you are experiencing mental health challenges.